Hello my lovelies! Today we are talking about beauty essentials of course, duh as you may have noticed this is another installment of my series On My Vanity. 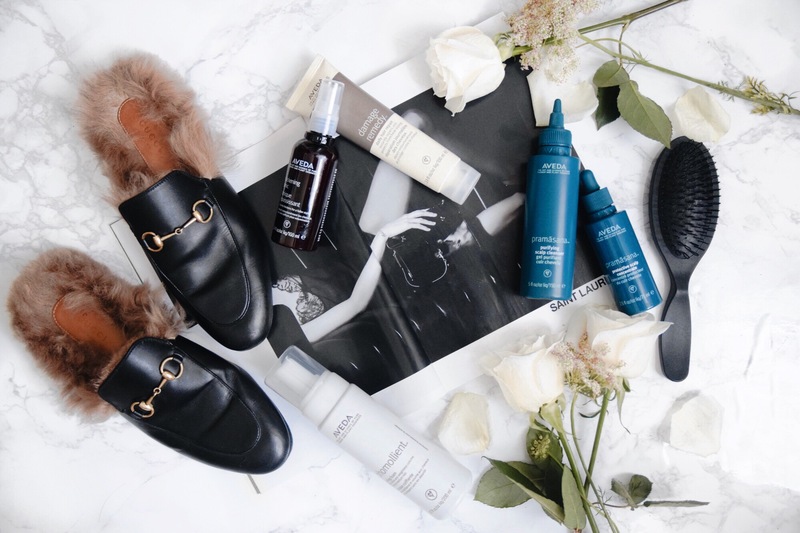 Today we are talking about something sort of rare for me and that is… HAIR CARE! I know I have talked about it previously but for those of you that don’t know I am what they might call hair-illiterate, meaning it’s not my best skill..doing hair that is. As a grown up gal I obviously would love to be a blow out expert but I was not born with this god given skill so anything I can do that’s simple, easy and effective I am totally on board. 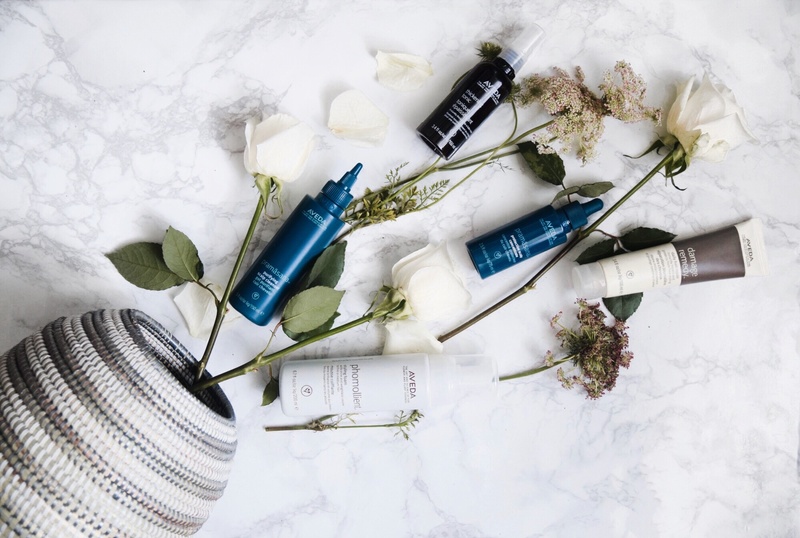 I recently had the chance to try out the Aveda Pramasana collection and it has been so much fun finally feeling like I myself am doing something wonderful for my hair. 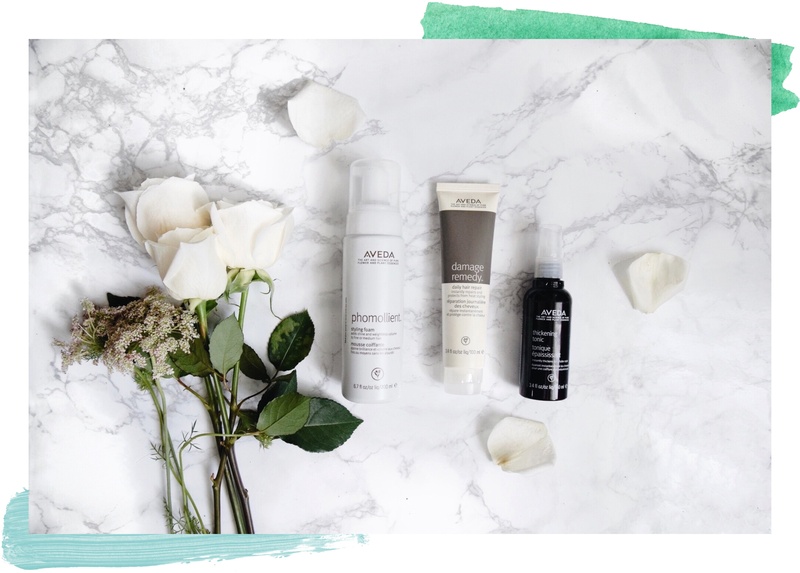 The Aveda Pramasana 3 step process is all about giving your scalp the proper care that it needs in order to create a perfect foundation for beautiful hair, I mean could that sound any better…honestly no because I know that we ALL want beautiful hair! 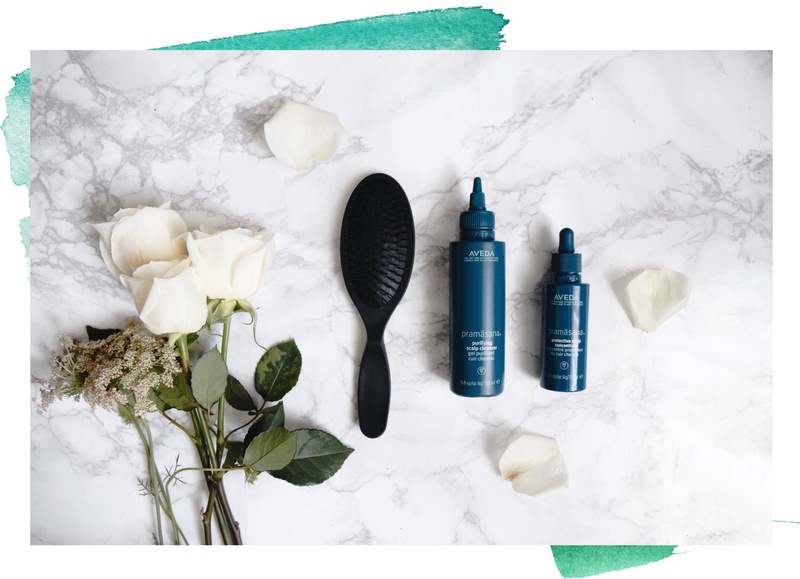 The steps include a cleanser, concentrate and a (life changing) scalp brush that all three work together to nourish your hair follicles so you can achieve the healthiest possible locks. And it’s honestly pretty simple and even the most hair-illiterate people, like me, can work it out. I tried the process for the first time on a little at home spa night and I probably used the exfoliating brush for way too long but, now I can give myself an amazing scalp massage all day long! 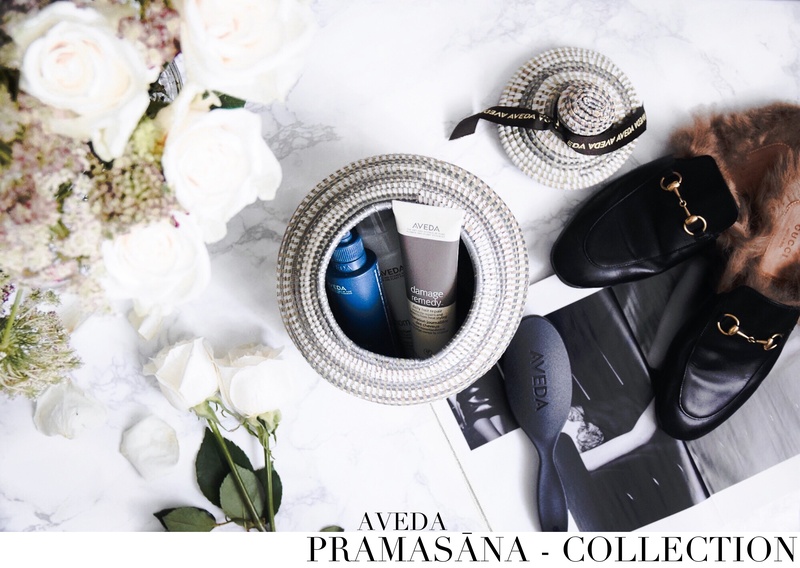 <pause for drooling with envy> Now let me explain just how this wonderful process works…..
My favorite and probably the most fun part of the three step process is the Pramasana Exfoliating Scalp Brush. Like I mentioned above it’s like a wonderful scalp massage you can do with just one hand and at home for that matter! Exfoliating your scalp with the scalp brush is the first step in the process. The brush works to loosen impurities and buildup prior to cleansing and is also supposed to increase micro circulation to the scalp while you are massaging. Feel free to do this part for as long as you want, and as often…I know I will! Okay, so the next step is to use the Pramasana Purifying Scalp Cleanser. The scalp cleanser is meant to be used in the shower every time before you shampoo your hair. This is in order to instantly balance sebum levels that create a clean scalp foundation. Remember to use this for your scalp because shampoo is for your hair…not your scalp so it’s not getting the proper and appropriate cleansing that it truly needs to be well nourished. The last but not least step in the Aveda Pramasana process is to use the Protective Scalp Concentrate. This lightweight serum is 96% naturally derived and meant to penetrate the surface layers of the scalp in order to nourish and help protect it from pollution and other free radicals. You want to apply the Protective Scalp Concentrate directly onto the scalp right after showering while your hair is still damp!